Pontiac Fiero Radiator - Fiero Radiator Info and Pontiac Radiators for Sale! Keep your Pontiac Fiero radiator running as cool as you are! Radiator Express brand OEM-quality replacement radiators drop right in to replace your worn out, leaking or blown factory Pontiac Fiero radiator. 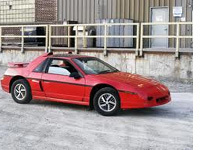 Make our efficient Pontiac radiators a part of your Pontiac Fiero cooling system. Keep your Pontiac running well for longer! Radiator Express sells quality replacement radiators for all seasons! Summer, winter, spring or fall - daily driver or track racer - we've got your Pontiac Fiero radiator needs covered no matter when and where you're driving, and our low prices won't run over your wallet! Radiator Express radiators arrive overnight in most states so you can be back in your Fiero and on the road in no time. Buy securely online at RadiatorExpress.com or via telephone toll-free (866) RAD-EXPR 1-866-723-3977 - Your Pontiac Radiator Experts are waiting to help you!